Concrete is an essential, durable construction material that Espina Paving has been installing, maintaining and repairing to the highest quality levels for commercial customers and large-scale industries for 30 years. Whether you need a new sidewalk installed, or have damaged curbs and gutters that need repair or replacement, or any other concrete installation, repair and maintenance needs, Call Espina Paving. We begin each project by meeting with you to discuss your needs, layout and the most recent building codes for ADA compliance (wheelchair ramps, extended width walkways, etc.). Together, we map the layout for your project and discuss any extra features you want such as adding stamp patterns or staining to add color to the concrete. We’ll let you know about all the possible options and help you stay on schedule and on budget. We excavate the area and install the sub base. If the new concrete is replacing old concrete, we completely remove the old concrete and send it to a recycling center. The sub base is the foundational layer; we ensure this is properly drained, compacted and free of debris, roots, old pipes, etc. 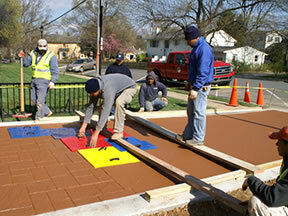 We place the forms that will give shape to the sidewalk or other structure. During this phase we also ensure proper slope so that water will easily drain off of the concrete in the right direction. We set reinforcing into place, if needed. We pour the concrete into the forms, then level and float it in preparation for the final finish. We cut control joints into the sidewalk to prevent cracking. We finish the concrete with floats and other finishing tools. Then we apply a broom finish to give texture to the sidewalk and prevent it from getting slippery in the rain and apply curing compound as necessary. 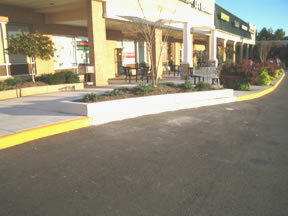 Espina Paving has a great deal of experience repairing and installing concrete curbs and gutters. Curbs and gutters often bear the brunt of trucks, snow plows, tree roots, poor parking etiquette, etc., so they can suffer a lot of damage over the years. 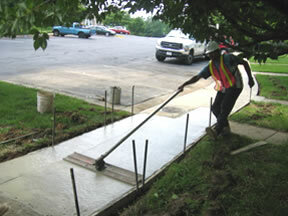 Concrete curbs and gutters are also essential to the sidewalk structure and any asphalt pavement they help to drain. Curbs and gutters ensure that rainwater flows away in the right direction off of the pavement. If we are installing new curbs and gutters, we work extensively on the layout with you to ensure good drainage slope. 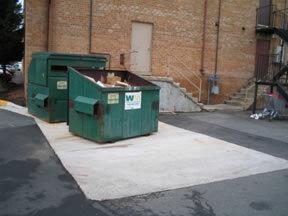 Any old or damaged curbs or gutters are removed and sent for recycling. We grade and compact the sub base as needed. 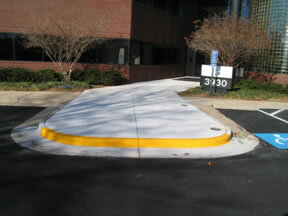 We install the forms that shape the curb and gutter area to create the proper grade. We pour the concrete. As the concrete dries, we remove the front of the form face so we can float and finish the exterior. After finishing the curb, we cure and seal it and do any necessary backfill. Concrete Stabilization—If you have areas of sunken concrete, these are usually the result of poor sub base preparation or drainage issues. We pump a special mixture of cement underneath the existing concrete to raise it level with the surrounding concrete slabs. Concrete Sealants—We apply sealants to protect concrete from erosion and corrosion from water, snowmelt chemical and other spills. Epoxy Coating—We apply chemical-resistant epoxy coatings that come in many different colors; this protects the concrete from spill corrosion and provides a great, customized finish. Crack Chasing—This is what we call cutting into concrete cracks to repair them with a filling compound such as an epoxy. Joint Caulking—We seal cracks in the concrete with a durable, flexible urethane caulk to prevent water from getting down into the foundation. This also prevents further cracking and erosion. 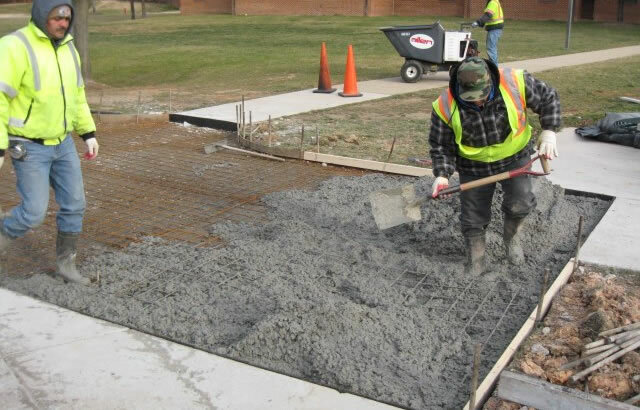 Grinding—We grind down the high side of two slabs of concrete so that it lies flush with lower sections; this prevents hazards such as tripping and falling. Power Washing—Pressure washing concrete can help it look fresher and extend its lifespan by removing corroding chemicals and spills. No matter what concrete structures your organization needs, the professionals at Espina Paving can provide expert technical evaluation, engineering, consultation, installation, repair and maintenance for all of your concrete needs. 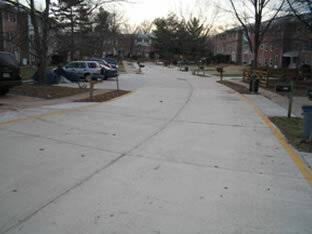 Contact Espina Paving for a free estimate today at (703) 491-9100. We look forward to working with you.